There must be some posts on your blog that you always wanted your visitor to read. For that you should place that post in the sidebar of your blogger blog. 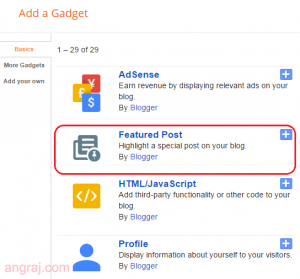 Now Blogger make this task easier for its users. A new widget Featured Post is added now to make one of your favorite post Featured on your Blog. 1. Go to Blogger dashboard and open Layout. 2. On sidebar click on ‘Add a Gadget’ (later you are drag it anywhere in your blog where you want it to appear). 3. Click on ‘Featured Post’ gadget. 4. Then configure Featured Post by selecting the desired post and click on save. Now your Featured post is ready to view for your readers you can change your post anytime. Thanks for sharing this helpful post, i really love to visit your blog again. things out. I like what I see so now i’m following you. Look forward to looking over your web page for a second time. I truly love your website.. Excellent colors & theme. Did you make this site yourself? in this article? I’d really love to be a part of online community where I can get responses from other knowledgeable people that share the same interest. must be go to see this web site and be up to date every day.